House of Bread is Offering Customers A New Twist on Fruitcake – The Holiday Loaf. Either pick up a loaf, learn to bake in a class, or enjoy a take home recipe for the Holiday Loaf. This holiday fruit bread beats the mysterious fruit cakes floating around this time of the year. 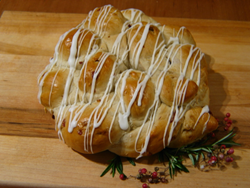 Flour, honey, yeast, salt, vanilla, dried cranberries, dried apricots and dried apples. House of Bread is pleased to offer customers a delicious alternative to traditional fruitcake this holiday season: the holiday loaf. The fresh-baked treat is a delicious fruit-laden bread with hints of vanilla and honey and is available every Friday and then everyday after December 20th through the 24th at House of Bread. Combine all dried fruit into a container, add water to half the height of the dried fruit. Proof the yeast – place the yeast in a ½ cup of the warm water until yeast dissolves. Add the honey to the mixture and within a few minutes, small bubbles will appear as the yeast ferments. Place the remaining water, vanilla, flour and salt into a large mixing bowl and then add the yeast. Using an electric mixer, mix on low for one minute and then increase to medium setting for 4 – 6 minutes. If the dough is too sticky, add a tablespoon of flour, and if too tough mix a few minutes longer until it feels soft. Add dried fruit when done mixing. Cover the dough with a damp towel and let rise in a warm place for 1 ½ hours or until the dough doubles in size. Punch down and place on flat, floured surface, shape as desired. Brush an egg wash on bread surface and place dough on a thoroughly sprayed cookie sheet. Preheat oven to 350. Allow the dough to rise second time, 15 – 40 minutes. Place pan in the middle of the pre-heated oven for 30 – 35 minutes. Check for doneness by tapping bottom of the loaf, it is done when it is firm and sounds hollow. Place on a wire rack to cool for a couple hours before slicing, or tear off a hunk, slather with butter and enjoy. Yield: 1 large two pound loaf or two one-pound loaves. If you have any questions, please call House of Bread at (805)542-0255 or email us at bread(at)houseofbread(dot)com.